I received this book in exchange for my opinion. No other compensation has been given. 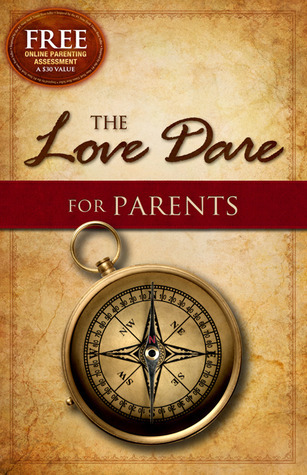 The Love Dare for Parents is a 40-day journey of “dares” challenging one or both parents to understand, practice, and communicate Christ-like love to their children. Easy to read and work into a busy schedule, The Love Dare for Parents is designed to “turn the hearts of parents to their children and turn the hearts of children to their parents” (Malachi 4:6) so that moms and dads can more fully enjoy and delight in their children while maximizing the positive impact they have on their lives long term. Each day brings a promising key verse from Scripture, a biblical principle about love that applies to parenting, a specific challenge the parent does for the sake of their child, and space to journal thoughts and reflect on what happened that day. The Love Dare for Parents even includes access to a FREE online parenting assessment, helpfully keyed to select material in the book. Stephen Kendrick is best known as a screenwriter and movie producer (Facing the Giants, Fireproof, Courageous) along with having co-wrote the New York Times best sellersThe Resolution for Men and The Love Dare with his brother, Alex. Stephen and his wife, Jill, have six children, and he serves as senior associate pastor of preaching and prayer at Sherwood Baptist Church in Albany, Georgia. Alex Kendrick is best known as an actor, writer, and director whose film credits include Facing the Giants, Fireproof, and Courageous. He and his wife, Christina, have six children. He also serves as associate pastor of movie outreach for Sherwood Baptist Church. I was blessed with this book in exchange for my honest opinion. I am not required to give a positive review. Love Dare for Parents is a 40 day challenge to develop Christ-like love and influence your children. Parenting is not a piece of cake. It takes time, effort, prayer and lots of hard work. This book teaches you about leading your heart not just giving into feelings and emotions. Each day consists of an opening Scripture, a devotional to read, and ends with a dare to accomplish. At the end of each day, there are questions to ponder and a place to journal your thoughts. I have not yet completed the whole book, but am working through it. Sometimes, I take several days to accomplish a dare, especially if life is busy or hectic that day. But, I can say, this book is definitely helping me become a better parent, be more aware, attentive, and have an open mind towards my children. It is teaching me better ways to love, lead and listen. I would highly recommend this book to any parent whose desire is to love their children in a more intentional Christ-like manner.